Residents of the city of Maricopa will be racing for something more important than medals or trophies next summer. They will be racing for life. Maricopa residents Grace Gomez, Gwen Traylor and others have been working diligently to bring the “Relay for Life” event to Maricopa. Relay For Life (often shortened to ‘relay’) is the main volunteer-driven cancer fundraising event of the American Cancer Society. The relay mobilizes communities throughout the country to celebrate people who have battled cancer, remember loved ones lost and provide participants with an opportunity to fight back against the disease. For this event members of the community essentially sponsor teams to participate in the relay. Then members of these teams take turns walking laps around a track during a 24-hour time span. “Everyone has been touched by cancer in some way; this is a great event to raise not only money for a cure, but awareness,” Traylor said. The Maricopa event is scheduled to take place March 25-26, 2011, from 6 p.m. to 6 a.m., at the Maricopa High School stadium. “We hope to have a minimum of 50 teams with 15 people on each team,” Traylor said. While the relay is the main attraction of the event, there will also be multiple booths, games, shrines to family members and other materials aimed at raising cancer awareness. “We all have a responsibility to help others, and this is a great way to do that,” Traylor said. The group is currently seeking volunteers and people interested in participating in the relay. To get involved, contact Gomez at 520-568-9407 or Traylor at 313-316-6761. 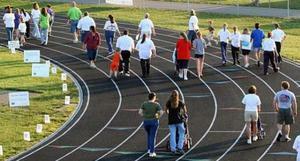 For more information about the Relay for Life, visit www.relayforlife.org.